It is no longer a question of “if,” but of “when.” But while there seems to be little doubt that it can be done, no one seems to know with certainty which of the myriad potential paths should be taken to make it a reality. 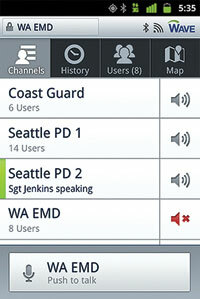 “It” is mission-critical voice over broadband for public safety — a capability that promises to provide first responders with new flexibility and feature sets. When perfected and implemented, most industry analysts believe it will signal an end to public safety’s dependence on private land-mobile-radio (LMR) devices that has existed for the better part of a century. In the minds of many, the transition is virtually inevitable. Leveraging broadband pipes to carry all forms of mission-critical information — voice included — is the most efficient way to utilize high-capacity IP communications systems that can be designed to be more robust, flexible and reliable than even the most hardened LMR networks. Such a transition makes sense on several levels. Fueled by the large economies of scale in the commercial market, broadband equipment should be more affordable, robust and feature-rich than comparable LMR equipment. Government entities would like to have all personnel on a single network — or at least a single technology — instead of having a separate, expensive network for public safety and another network for the rest of the enterprise. It’s a topic of considerable conversation and consternation among first responders, communications officials and elected officials, particularly as crucial policies are being determined regarding spectrum use, funding and access to next-generation public-safety networks. By almost all accounts, transmitting mission-critical, voice-over-broadband network technologies such as LTE is technically possible, but it’s not available today. And, despite the U.S. military’s development efforts in this arena, no one can say with any real certainty when it will be available, because there are myriad technical, political, operational and financial challenges that must be solved before mission-critical voice over broadband can become reality. Some industry pundits have speculated that mission-critical voice over broadband could be available within a few years, while others project it will not happen during the next decade. Still others note that, even when these solutions are available, first-responder agencies will be obligated to continue using their LMR networks for another 15 to 25 years before being able to consider making a transition to a broadband-voice solution. But change is on the horizon, as the U.S. military is testing the feasibility of using commercial technology in its mission-critical environments, said James Mustarde, marketing director for Twisted Pair Solutions, which has developed an IP-based platform that allows users of disparate networks and technology devices to participate in talk groups — a model he believes will become commonplace.